Background/Aims Optical coherence tomography (OCT) has become standard of care in the diagnosis and management of a myriad of retinal and optic nerve pathology. Access to diagnostic equipment and skilled imaging personnel in the after-hours setting is often limited. We examined the utility and diagnostic indications for automated OCT in a high-volume after-hours clinic within an eye institute. Methods OCT images obtained over a period of 15 months were reviewed in the context of electronic patient records. Residents and fellows were surveyed regarding their experience with the OCT and its value in emergency patient management. Results 202 patients and 359 eyes were examined. Complaints prompting imaging included flashes/floaters, metamorphopsia, decreased vision and scotomas. Diagnoses included vascular occlusion, retinal detachment, macular hole, cystoid macular oedema and central serous retinopathy. Of the 25 residents and fellows surveyed, most agreed that the OCT that facilitated delivery of optimal urgent management. OCT also aided in the triage of patients to specialty clinics. Conclusion Expanded access to automated OCT in the urgent care setting shows promise for improving the accuracy and timeliness of diagnosis, which can be critical for optimising patient outcomes. OCT also provides clear, immediate documentation of pathology for substantiating medical decision-making. Optical coherence tomography (OCT) has become standard of care of diagnosis and management of retinal and optic nerve pathology. The utility of automated OCT in after-hours urgent care clinic has not been studied. Our results indicate automated OCT aids in the management of patients in a high-volume after-hours clinic. The results of this study may expand the application of automated OCT to more urgent care centres and general emergency rooms. Optical coherence tomography (OCT) has evolved as an integral imaging modality in the diagnosis and treatment of a wide variety of ophthalmic disease. OCT reveals subtle macular changes, often imperceptible on clinical examination, including retinal nerve fibre layer (RNFL) changes, intraretinal alterations and subretinal disturbances. OCT is also useful for assessing optic nerve health and has become standard of care for the management of glaucoma. Despite its utility, OCT is usually only available during normal working hours in the outpatient clinic setting. Other ophthalmic imaging modalities such as ocular ultrasound1 and non-mydriatic fundus photography are already being used in emergency settings, performed by non-ophthalmology practitioners, to diagnose ocular pathologies that otherwise would have been misdiagnosed or undiagnosed.2–4 Expanding availability of these modalities has improved triage, led to earlier appropriate ophthalmology consultation and has expanded access to specialty care in underserved areas. We hypothesised that OCT can further enhance a clinician’s ability to diagnose eye conditions in an emergency setting. To our knowledge, use of OCT has never been studied in such settings. In this study, we examined the utility of an automated OCT system (Optovue, IScan) in a resident-run after-hours eye clinic for evaluation of acute visual complaints. Residents and fellows were surveyed to assess their experience with the device and their perception of its acute diagnostic value. This study adhered to the tenets of the Declaration of Helsinki and the Health Insurance Portability and Privacy Act of 1996 and was approved by the Institutional Review Board of The New York Eye & Ear Infirmary of Mount Sinai. Ophthalmology residents at The New York Eye & Ear Infirmary of Mount Sinai were trained to operate an automated OCT (Optovue) capable of scanning the macula (en face, 3D slices, thickness map), optic nerve (RNFL) and anterior segment (angle, corneal pachymetry). Training took less than 30 minutes. The OCT device employs computerised voice directives in a wide variety of languages directing patient positioning and fixation. The OCT was made available in the after-hours eye-only urgent care. Residents were not required to use the OCT and performed imaging only when they believed the information would aid in diagnosis and treatment. After a period of 15 months, images obtained were reviewed alongside patient charts from the electronic medical record. Chief complaint, image type, image findings and diagnosis were analysed. Additionally, residents and supervising fellows (retina, cornea, glaucoma, oculoplastics) staffing the urgent care were surveyed regarding their experiences with the OCT. Participation in the survey was voluntary. Specifically, residents and fellows were asked if they had participated in patient care where OCT was used and, if so, whether the OCT changed the management of the patient. Also, they were asked whether they felt it reduced medical errors and whether it reduced physician stress due to the responsibility for providing optimal patient care. Total 359 eyes of 202 patients were examined between August 2016 and October 2017. Total 178 (88%), 21 (10%) and 3 (2%) patients underwent OCT imaging of the macula, optic nerve and anterior segment, respectively. Complaints that prompted imaging included flashes/floaters (32, 16%), metamorphopsia (10, 5%), decreased vision (120, 59%), scotoma(s) (21, 10%) and pain (6, 3%). Imaging was also performed in asymptomatic patients with incidental findings. Table 1 summarises the diagnoses imaged by OCT. OCT imaging was particularly useful in the diagnosis of vascular occlusions (figure 1), subretinal fluid with or without choroidal neovascularisation (figure 2), solar retinopathy (figure 3), macula-on versus macula-off retinal detachment (RD) (figures 4 and 5) and central serous retinopathy ((CSR) (figure 6)). OCT was helpful in ruling in pathology in 127 patients (63%) and ruled out pathology in 61 patients (30%). In all cases with poor image quality, visual acuity in the affected eye was 20/400 or worse. These results are summarised in table 1. Automated OCT of the left macula in a 60-year-old woman complaining of decreased vision in the left eye for 1 week. Funduscopy revealed mild thickening in the nasal macula. 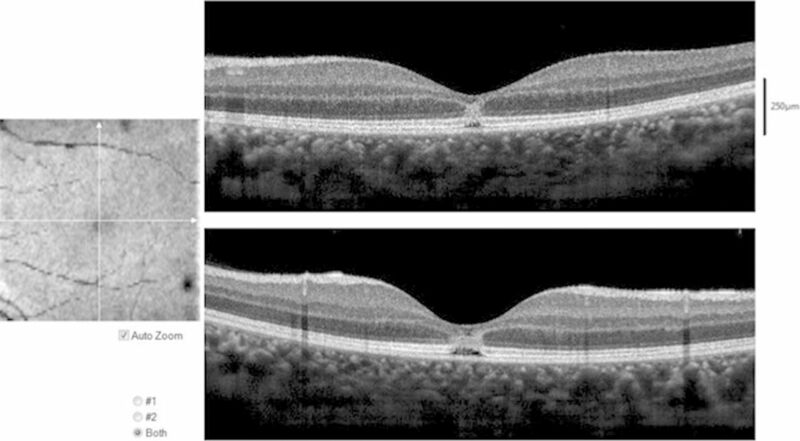 OCT of the macula showed increased reflectivity of the inner retinal layers and loss of definition suggesting a diagnosis of reperfused central retinal artery occlusion with PAMM. OCT, optical coherence tomography; PAMM, pericentral middle maculopathy. Automated OCT of the right macula in a 64-year-old woman who complained of distorted vision and was found to have a small haemorrhage in the nasal macula on funduscopic examination. OCT revealed subretinal haemorrhage and exudate suggesting a choroidal neovascular membrane. The patient was referred to retina clinic where fluorescein angiography revealed leakage consistent with a choroidal neovascularisation, for which prompt anti-VEGF therapy was initiated. OCT, optical coherence tomography. Automated OCT of the left macula in a 26-year-old woman who complained of a scotoma after viewing the solar eclipse of 2017 without eye protection. The horizontal (top) and vertical (bottom) cross-sections demonstrate focal disruption of the outer retinal layers from the inner nuclear layer to the interdigitation zone consistent with solar retinopathy. OCT, optical coherence tomography. Automated OCT of the left macula in a 63-year-old man complaining of a curtain in the left eye demonstrating a retinal detachment extending to the edge of the fovea. Best corrected visual acuity was 20/50; the patient was taken for urgent retinal detachment repair. OCT, optical coherence tomography. Automated OCT of the right macula in a 54-year-old man complaining of a curtain. OCT demonstrated a low lying retinal detachment partially bisecting the fovea. Best-corrected visual acuity was 20/40. OCT, optical coherence tomography. Automated OCT of the right (A) and left (B) maculae in a 30-year-old woman complaining of a blurry spot in the left eye. Visual acuity was 20/20 in the right eye and 20/50 in the left eye. OCT revealed subfoveal collections of fluid in both eyes. The patient was on chronic oral prednisone therapy for systemic lupus erythematous and was diagnosed with bilateral central serous chorioretinopathy. OCT, optical coherence tomography. Twenty-five residents and fellows participated in the survey. All residents (18) and fellows (7) found the OCT to be helpful; 15 residents (83%) and 4 fellows (57%) felt that it changed management. Twenty-one (83%) participants felt that the OCT improved patient satisfaction and reduced delayed or misdiagnosis. Nineteen (76%) participants reported reduced stress in patient care when using the OCT; of these were 4 fellows (57%), 7 PGY2 residents (100%) and 6 PGY3 residents (86%). OCT has become the standard of care for diagnosing a variety of ocular pathologies, but is generally not available at most institutions after-hours, when many patients present with acute complaints. This study demonstrated the several advantages of having an OCT for diagnosis and management of acute complaints and of ocular emergencies. In the after-hours or acute-care setting, the most important goal of care is the timely diagnosis and treatment of vision threatening pathology while efficiently using ancillary testing and consultants. For example, timely diagnosis of central retinal artery occlusion (CRAO) is critical for proper ophthalmic and medical management. However, fundus examination alone may fail to reveal a cherry red spot or retinal opacification in up to 10% or 42% cases of CRAO, respectively. OCT provides much higher sensitivity for detection of ischaemia in acute CRAOs.5 6 Our study included six patients with CRAO, and OCT successfully confirmed the diagnosis in five of those patients. In one patient, poor visual acuity prevented adequate fixation to obtain a useful image. As shown in figure 1, the OCT demonstrated characteristic hyper-reflectivity and obscuration of internal retinal layers in a case of CRAO. In the emergency setting, where fluorescein angiography is usually unavailable, OCT helps provide early objective confirmation of this diagnosis. OCT may be particularly helpful in subtle cases without characteristic fundus findings in the absence of severe visual loss. For example, a 60-year-old woman presented with decreased vision for 1 week in her left eye. Her visual acuity in the left eye was 20/640, pinhole to 20/50. Funduscopy revealed mild thickening in the nasal macula. OCT of the macula showed inner retinal hyper-reflectivity with loss of definition of individual retinal layers, which suggested a diagnosis of recent CRAO (figure 1); the patient was transferred to the emergency room for cardiovascular workup. We have also found it helpful to have OCT documentation of CRAO at the time of urgent care visit as clinical picture may be different by time of follow-up visit; for instance, the retina may reperfuse by the time the patient is seen by a retina attending during normal business hours. While there is no treatment with proven efficacy in reperfusion of the retina, many institutions, including ours, offer intervention to patients such as ocular massage, intraocular pressure lowering, carbogen inhalation with varying degrees of success.7 8 All CRAO patients require transfer to a hospital for systemic workup. Additionally, for patients presenting within the safe therapeutic window, our institution offers intra-arterial thrombolytic therapy with tissue plasminogen activator through interventional neuroradiology. Immediate OCT allows us to confirm the diagnosis for rapid triage in appropriate cases. OCT was also helpful in identifying other retinal pathology necessitating prompt evaluation and treatment by retina specialists with urgent retina clinic referral. For example, a 64-year-old woman who complained of distorted vision was found to have a small haemorrhage in the nasal macula on funduscopic examination. OCT of the macula revealed subretinal haemorrhage and exudate consistent with a choroidal neovascular membrane (figure 2). The patient was referred to retina clinic where fluorescein angiogram revealed leakage consistent with choroidal neovascularisation, for which prompt anti-vascular endothelial growth factor (VEGF) therapy was initiated. Four other cases of new choroidal-neovascularisation were identified with OCT. The OCT proved invaluable in our after-hours clinic following the solar eclipse of 2017. The OCT ruled out solar retinopathy in most patients (n=9), reassuring the patients and precluding the need for retina clinic referral. The OCT also confirmed solar retinopathy in two patients (figure 3). Another example of the OCT’s utility is the case of a man who presented with metamorphopsia and was referred for neurological workup after OCT confirmed lack of macular pathology; he was found to have optic neuritis and brain lesions consistent with multiple sclerosis. As macular/foveal involvement is a critical factor for planning timing of surgical intervention and predicting visual prognosis following RD, OCT was a valuable adjunct to clinical examination.9–11 OCT was used to differentiate macular-involving versus macular-sparing RD in 39 (19%) patients. figure 4 demonstrates a narrowly fovea-sparing RD, a level of detail often not determinable on clinical examination; the patient was taken for urgent retinal detachment repair. In another case, despite the patient’s best corrected visual acuity of 20/40, OCT showed a partial foveal involving retinal detachment, aiding in surgical planning and patient counselling regarding the prognosis (figure 5). In cases of macula-off retinal detachments, the OCT provides objective documentation. As most ophthalmic lawsuits in the USA relate to RD, such documentation substantiates the appropriateness of care in the after-hours setting.12 This documentation may be relevant to several diagnoses, including CRAO or choroidal neovascularisation as discussed above. The OCT is also helpful in ruling-out emergent pathology, thus helping refine triage of patients to subspecialty clinics in our hospital and reducing need for after-hours subspecialty consults. For example, patients with suspected CSR were generally given follow-up appointments in the retina clinic within a week of presentation prior to the availability of OCT. Our study included 14 patients with CSR (7%), as shown in figure 6. With OCT verification, follow-up appointments could be extended to 3 weeks without fear of occult choroidal neovascular membranes. Furthermore, OCT has been shown to be more sensitive for detecting CSR than slit-lamp examination, and likely aids in detecting cases that would otherwise be temporised.13 In our study, the majority of patients had normal findings (56, 28%), demonstrating its utility in ruling out pathology. For example, a patient who reported a history of contralateral CSR complained of visual disturbance; without OCT verification of flat maculae, the patient would have likely been referred to retina clinic rather than neuro-ophthalmology. In three patients with a history of anterior uveitis, including a child, and a complaint of blurry vision or metamorphopsia, OCT was used to rule out cystoid macular edema (CME); without OCT availably, these patients would have been brought back for urgent imaging. The OCT was also used to document absence of pathology in patients referred from outside ophthalmologists and optometrists for neuro-ophthalmic diagnoses such as optic nerve head oedema. The OCT may also improve patient satisfaction. Bed-side ultrasonography has been shown to improve patient satisfaction, likely due to expedited care and diagnosis.14 As discussed above, OCT allowed residents to show patients OCT images, explain the course and prognosis of CSR, reassuring the patient while offering a practical follow-up appointment. In the many cases where pathology was ruled out by the OCT, the patient left our institution having undergone state of the art imaging to assuage their concerns rather than with continued anxiety until such imaging could be obtained. While this study did not survey patients, almost all practitioners perceived enhanced patient satisfaction in connection to the OCT.
OCT in our after-hours clinic also benefited our clinicians in training. Most residents and fellows felt that the OCT reduced their stress levels. Uncertainty has been correlated with physician stress.15 Having an instrument as sensitive as OCT accessible to rule out subtle pathology removes a significant degree of uncertainty. For instance, when a resident calls a retina fellow describing a macula sparing retinal detachment, the OCT substantiates that the macula is not involved. Additionally, the OCT was felt to reduce medical errors by most residents. Medical errors cause both short-term and long-term emotional stress in residents.16–20 The benefit of reducing stress and medical errors is more likely to be found in residents early in their training; this was corroborated by the survey results as a larger proportion of first year residents found stress reduction in connection to the OCT than did second year residents or fellows. We believe that as clinical examination skills improve, the scope of pathology necessitating ancillary imaging narrows. One limitation of this device is the minimum vision requirement necessary for patients to find fixation cues without operator redirection. A small number of attempted scans had insufficient signal strength, all in patients with visual acuity 20/400 or worse. As the automated OCT required some fixation ability on the target, severely decreased visual acuity prevented adequate alignment. While this OCT allows for manual adjustment, this can be time consuming and may require an operator with greater skill and experience. Most manual OCT devices such as Zeiss Cirrus or Spectralis can obtain quality OCT images in patients without optimal fixation, but require more training, skill or experience for successful imaging. By comparison, technical training required to use this device was very brief making it more easily available to residents with limited imaging experience. W The option to use the fellow eye for fixation limitation could be helpful in cases requiring manual override. In conclusion, OCT accessibility in the after-hours setting improved the diagnosis and disposition of patients. Residents and fellows reported that the availability of the OCT changed clinical management, improved patient satisfaction and reduced practitioner stress. Additional studies will be helpful to further appreciate the benefits of including OCT alongside clinical examination in both eye-only and general emergency settings.
. Malpractice risk: retinal detachments. Eyenet Magazine 2018:49–53. Presented at Preliminary results presented as a poster at The Association for Research in Vision and Ophthalmology Annual Meeting, 7-11 May 2017, Baltimore, MD. Current results presented as a poster at The Association for Research in Vision and Ophthalmology Annual Meeting, 29 April to 3 May 2018, Honolulu, HI. Contributors RIK, MG, RBR: conception and design. RIK, MC: data acquisition. RIK, MC, MG, RBR: data interpretation, drafting the article and final approval of the version to be published. Competing interests RBR reports personal fees from Optovue, Allergan, Regeneron, Nano Retina, Opticology, Ocata Medical and Clarity, outside the submitted work. MC, RIK and MG have nothing to disclose. Ethics approval New York Eye and Ear Infirmary of Mount Sinai.